Puma have launched their new range, the Pulse. The Pulse range includes Bats, Gloves, Pads and the eye catching red coloured shoes. A few of the Deccan players, Parthiv Patel, Daniel Harris, Shikhar Dhawan and Tanmay Mishra launched the shoe in India. 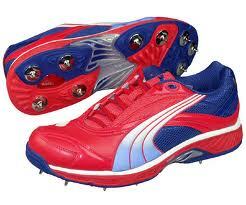 Most of the overseas pros and local heroes are using the Pulse shoes in the Indian Premier League. I just stumbled upon your blog and wanted to say that I have really enjoyed reading your blog posts. Any way I'll be subscribing to your feed and I hope you post again soon.cricket shoesA fantastic presentation. Very open and informative.You have beautifully presented your thought in this blog post.